Young people of the Armenian youth congress commemorate the murder of Hrant Dink in Istanbul in the 100th year after the beginning of the Armenian Genocide in Berlin, Hanover, Dortmund, Cologne, Frankfurt, Nuremberg and Munich. The scenery of his murder is going to be re-enacted at the time of crime. Freedom of press belongs to one of the fundamental freedom rights of a democracy. The attack on the office of the satirical magazine “Charlie Hebdo” on 7th January 2015 in Paris shows that this fundamental right has its risks. People who express their criticism in public, in written form or graphically often encounter resistance or even murder threats which eventually can be verified in some cases. 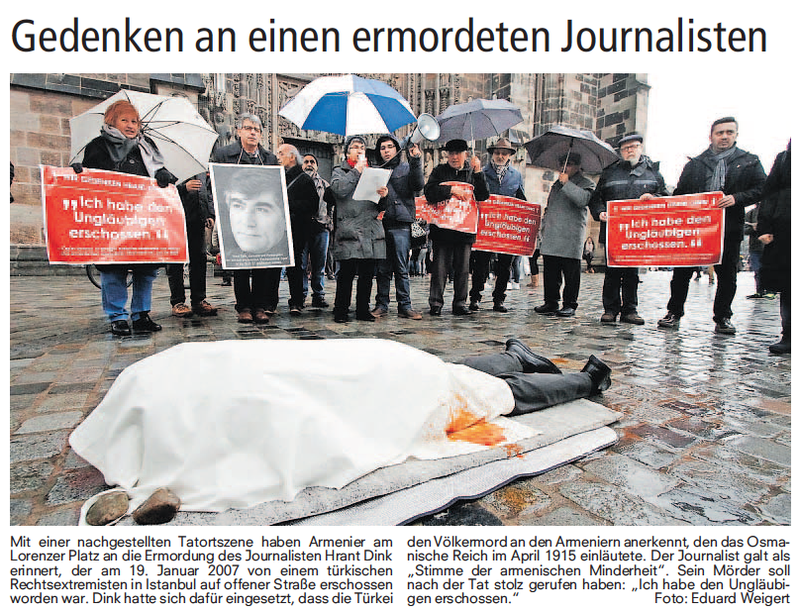 The Armenian journalist Hrant Dink also had to suffer this fate. On the 19th of January 2007 the then 17-year-old Turkish right-wing extremist Ogün Samast shot dead Armenian journalist Hrant Dink in the middle of the street in broad daylight in Istanbul. After his crime Ogün Samast supposedly shouted bravely “I have shot the infidel”. The justification for his crime – Hrant Dink continuously supported the reappraise of the Genocide against 1.5 Million Christian Armenians in 1915. In this Genocide – tolerated by the German Empire – not only Armenians were slaughtered, but also hundreds of thousands of Arameans/Assyrians and Pontic Greeks. Until today the Turkish government is still denying that a Genocide against the Armenians did take place. This active policy of denying is also being pursued in Germany. Denying a Genocide is a continuation of this crime against humanity only with different means. “Hrant Dink supported the reappraise. He was the voice of the Armenian minority in Turkey as well as the voice for all the Turks who did not close their eyes to the truth. Not only did he fight for the recognition of the Genocide, but also did he fight against Discrimination of Armenians and other minorities in present Turkey.” Says press spokeswoman of the action, Anahid Akkaya. That is why he was shot on the street in broad daylight. Hrant Dink became the most recent victim of a Genocide which started in 1915. The voice of the Armenians in Turkey should become silent. The background, and especially the involvement of the Turkish government concerning the murder of Dink are up until now not disclosed. “The Hrant-Dink-Action is an opening to a special commemorative year. A hundred years ago in April 1915 the Armenian Genocide in the Ottoman Empire started. 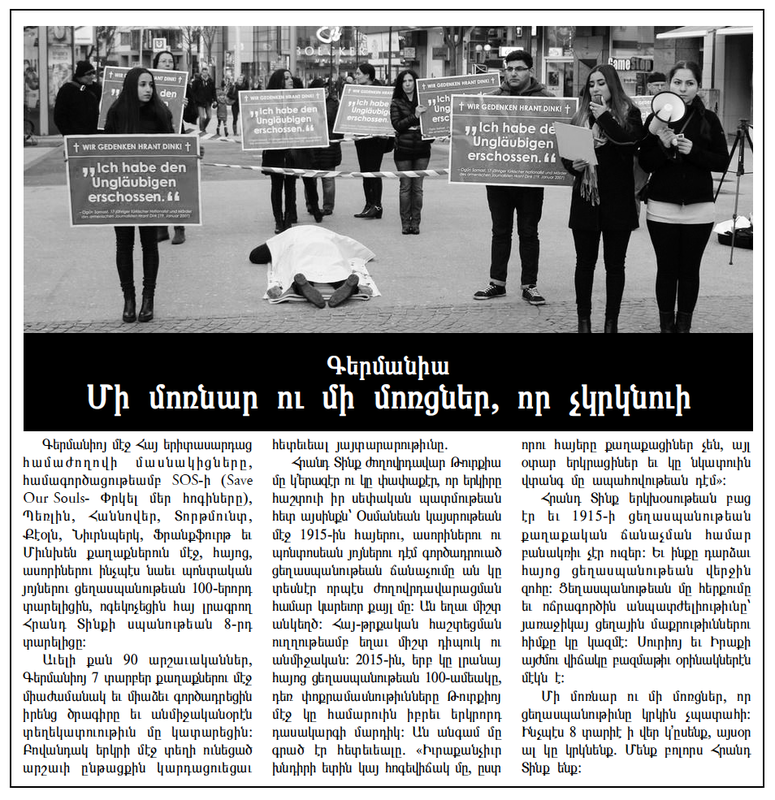 With diverse events we want to remind of the first Genocide of the 20th century in Europe and we demand that the German government and the German Bundestag recognize the Armenian Genocide to set an example against denial.” Explains lawyer Ilias Uyar of the Armenian Church in Germany and coordinator of the campaign. Just as the denial of the Genocide, also the impunity of the culprits provides breeding ground for renewed mass murder. The support and toleration of the Turkish government for the massacres of the ISIS against Christians, Yezidi and Kurds in Syria and Iraq are an example for this terrible connection.